Also serving communities of Lynchburg. There are 8 Assisted Living Facilities in the Tullahoma area, with 3 in Tullahoma and 5 nearby. 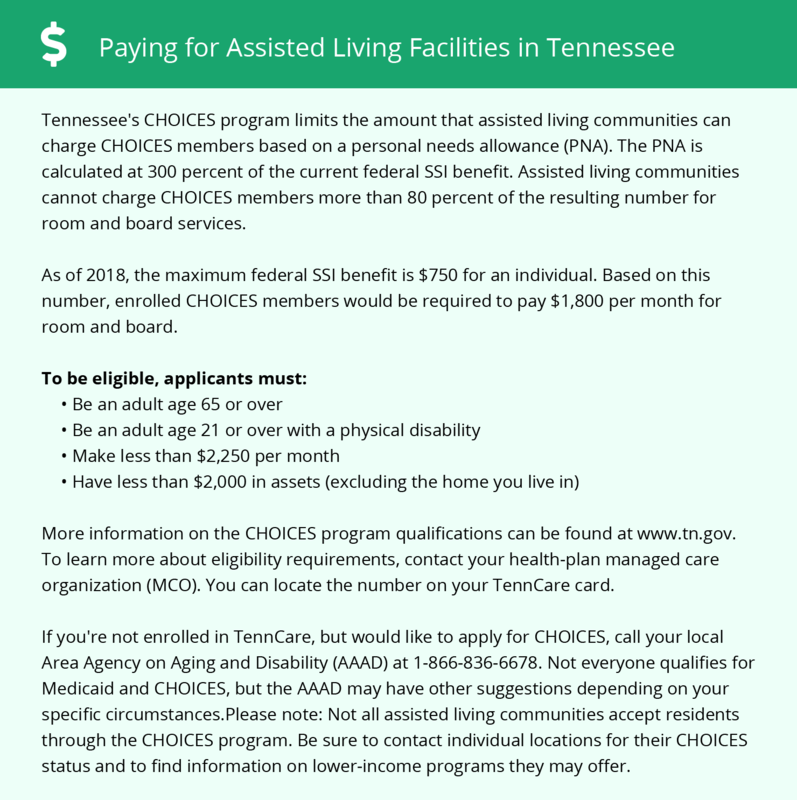 The average cost of assisted living in Tullahoma is $3,625 per month. This is higher than the national median of $3,346. Cheaper nearby regions include Manchester with an average starting cost of $2,640. To help you with your search, browse the 19 reviews below for assisted living facilities in Tullahoma. On average, consumers rate assisted living in Tullahoma 3.1 out of 5 stars. Better rated regions include Manchester with an average rating of 3.8 out of 5 stars. Caring.com has helped thousands of families find high-quality senior care. To speak with one of our Family Advisors about assisted living options and costs in Tullahoma, call (855) 863-8283. Located between Nashville and Chattanooga, Tullahoma is a small town that is known as a world leader in flight and engineering research. It offers small coffee shops, antique stores and several lakes and natural areas for seniors who love to explore. Tullahoma has a healthy senior population of around 3,600, some of whom require assistance with daily living. To help provide homes for these seniors, there are eight assisted living facilities in the area. These facilities are most often referred to as assisted care living facilities. They are regulated by the Tennessee Department of Health. Average temperatures in Tullahoma range from 87 degrees to 28 degrees throughout the year. Summers are hot, humid and often rainy, and winters are cold and short. The cost of living index in Tullahoma is 86.2, which is based on the national average of 100. This makes the city an affordable option for seniors looking for a place to retire. The city’s cost of living average is also lower than the state average of 96. Crime in Tullahoma is ranked on a scale from one (low) to 100 (high). Violent crime is ranked 50.6, which is higher than the national average of 31.1. Property crime is ranked 51.7, which is also higher than the national average of 38.1. Seniors may want to inquire about the safety measures of prospective assisted living facilities before making a decision. For transportation, the MidCumberland Public Transportation system is available for seniors at discounted fares. Curb-to-Curb rides are available at flexible schedules to meet the needs of seniors in the area. Rides are available on a first-come, first serve basis and advanced notice is not required. The Tullahoma area is home to world-class medical facilities, including Tennova Healthcare, in the event of medical emergencies or illness. Tullahoma has an array of community resources for seniors, including the Coffee County Senior Citizens, Inc., an organization that coordinates services for seniors in the area, as well as one senior center. Assisted Living costs in Tullahoma start around $3,625 per month on average, while the nationwide average cost of assisted living is $4,000 per month, according to the latest figures from Genworth’s Cost of Care Survey. It’s important to note that assisted living rates in Tullahoma and the surrounding suburbs can vary widely based on factors such as location, the level of care needed, apartment size and the types of amenities offered at each community. Two Medicaid waivers help seniors pay for assisted living care in Tullahoma and other parts of the state. This includes the Long-Term Services and Supports waiver and the CHOICES program. Medicaid limits the amount a facility can charge for room and board to 80 percent of the personal needs allowance (PNA). For seniors who need additional help, family supplementation is permitted up to the maximum allowable charges for room and board. Tullahoma and the surrounding area are home to numerous government agencies and non-profit organizations offering help for seniors searching for or currently residing in an assisted living community. These organizations can also provide assistance in a number of other eldercare services such as geriatric care management, elder law advice, estate planning, finding home care and health and wellness programs. To see a list of free assisted living resources in Tullahoma, please visit our Assisted Living in Tennessee page. Tullahoma-area assisted living communities must adhere to the comprehensive set of state laws and regulations that all assisted living communities in Tennessee are required to follow. Visit our Assisted Living in Tennessee page for more information about these laws.